Successfully Added Rechargeable + Alkaline Battery Charger to your Shopping Cart. This battery charger is engineered to reactivate and charge disposable batteries such as Alkaline and recharge NiCd, NiMH, and Lithium rechargeable batteries. It also comes with a battery tester that has an easy-to-read LCD screen and adjustable sliding arm for varying battery sizes. Battery Charger : Disposable Alkaline batteries always contain 20% more power when they appear to run dry. The remaining 20% can't be accessed unless you reactivate your batteries using this special battery charger. This battery charger lets you reactivate your dead batteries instead of buying new ones. It will also provide you with up to three re-charges on regular disposable batteries after they have been reactivated, giving you more value for your money! 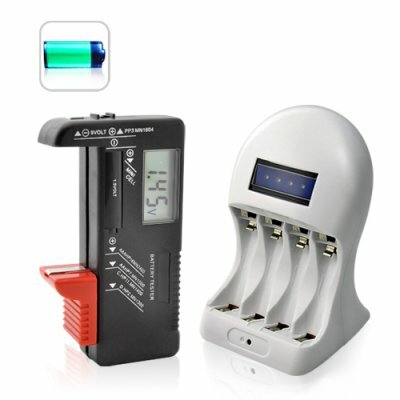 This rechargeable + alkaline battery charger comes with 4 LED indicators, one for each AA or AAA battery inserted. The LED indicators will flash Red and Green to indicate that the batteries are charging, and finally stay on Green when the job is done. Battery Tester : You may be wondering, how will you know when your battery is dead? Or perhaps you have some old batteries lying around and you have no idea how much power is left. Well, this battery charger comes with a battery tester that's got a convenient chart located at the back of the battery tester to help you determine if your batteries are in good condition, or need a recharge. If you have any use for batteries at all (and who doesn't), then this battery chargers' amazing wholesale price is only one of the many reasons to get this cool gadget. Click "Add to Cart" now and we'll express ship you a sample right away. This exclusive combo deal is brought to you by the leaders in China wholesale electronics - Chinavasion. List this cool electronic gadget on your drop ship website or eBay listing page and start making profits right away! After reactivating the last 20% of a non-rechargeable battery, can I then recharge it to 100% capacity, or is the maximum recharge percentage, 20% capacity? The maximum you can recharge a non-rechargeable battery after reactivating it for the first time is 20%. Please note, you can only recharge your non-rechargeable batteries for up to 3 cycles. Definitely, the small hand held size and light weight makes it a perfect tool to keep in your bag and take it with you wherever you go. If you have a kid with lots of toys and their need for batteries every now and then you will highly appreciate this god sent gadget! I use it with cheapest IKEA batteries and it reactivates them as promised. They turn into brand new state and they last as the new ones!